This month's exclusive stamp set Cozy Wishes is perfect for creating cards for warm Holiday Wishes or to give as a gift. The sentiments are also soo stinkin' cute. 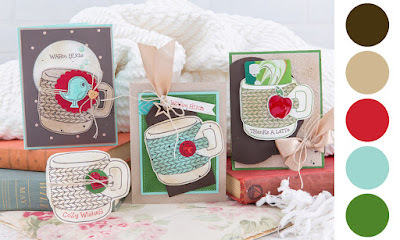 Express gratitude and stamp "Thanks a Latte" or warm someone's heart and stamp "Warm Hugs"
Our Kit of the Month comes with 4 different precut and predesigned cards, that include step by step instructions so you can easily recreate each card.Of course you can always get creative and put your own creative touch/spin on them. 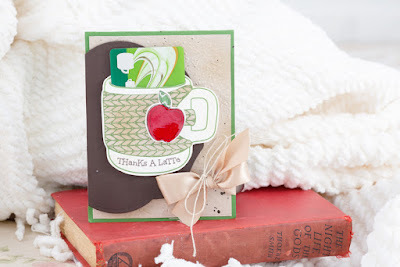 This card would be a great gift for a Teacher, especially with the little apple embellishment! Cut a slit at the top of the mug so you can slide your gift card in the top. What Fun! This card (above) uses some printed stock from our Paris Vintage Collection. 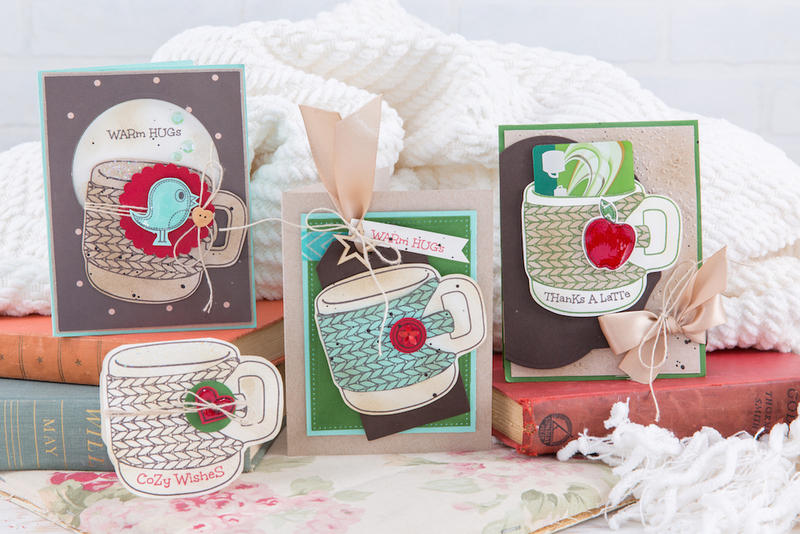 Don't you just love those mini polka dots? 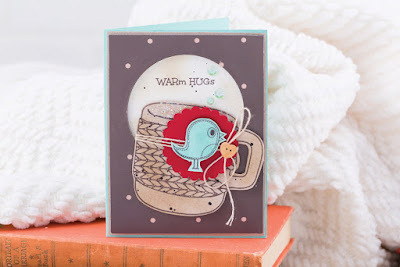 For this card you need a little elbow grease (jk, it's optional) to prep for the fussy cutting you will be doing, but the outcome for the effort is adorable. Add a little sparkle cuts from some extra shine! It's all about layers on this card, using a Steel Rule Tag Die (which comes precut for you) and the piercing element from our Journey Rectangle Die. 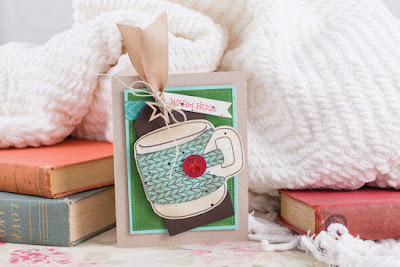 Pop it all up with foam squares add some ribbon and a star and you have this fabulous card. By choosing a subtle Christmas-y Color Crush you can create these wonderful cards. I love how the Cool Pool adds softness to the Cranberry Bliss and Kiwi Slice. 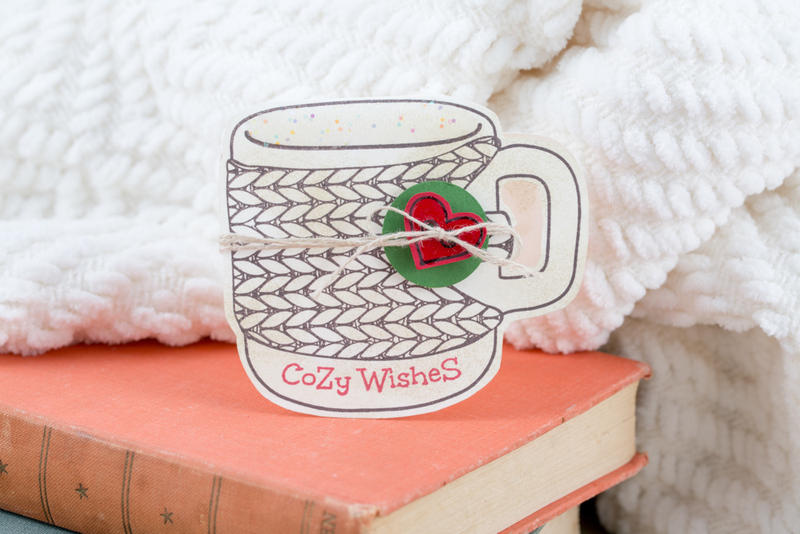 The Dark Roast and Oatmeal Cookie add so much warmth. Oh my gosh!!! SO cute! I love them!